Indian Army TA Bharti Program Bihar, Madhya Pradesh, Orissa, Uttar Pradesh, Uttarakhand, Jharkhand and Chhattisgarh states. 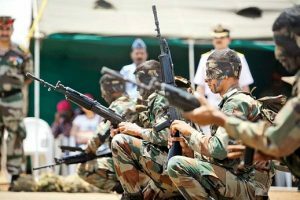 Indian Army TA Army Bharti Program Assam, Meghalaya, Manipur, Tripura, Nagaland, Sikkim, West Bengal, Mizoram, Arunachal Pradesh and Andaman & Nicobar Island. 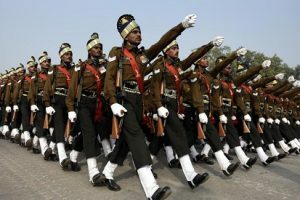 Indian Army TA Army Bharti Program Andhra Pradesh, Gujarat, Kerala, Tamil Nadu, Maharashtra, Rajasthan, Karnataka, Telangana and the Union Territories of Dadar and Nagar Haveli, GOA, Daman & Diu, Lakshadweep and Pondicherry. 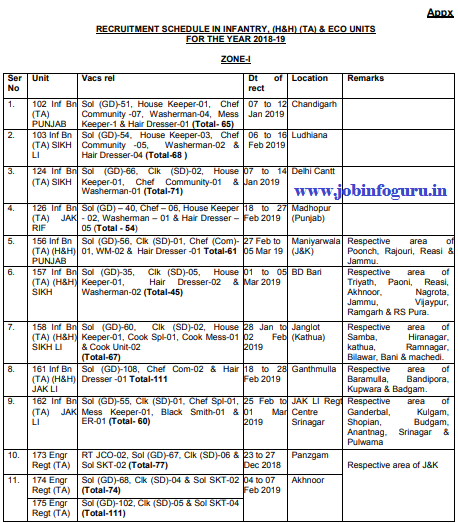 TA Recruitment Zone I: TA Army Bharti Program Bharti Haryana, Himachal Pradesh, Jammu and Kashmir, Punjab States and the Union Territory of Delhi and Chandigarh of India. TA Recruitment Zone II: TA Army Bharti Program Bihar, Madhya Pradesh, Orissa, Uttar Pradesh, Uttarakhand, Jharkhand and Chhattisgarh states. 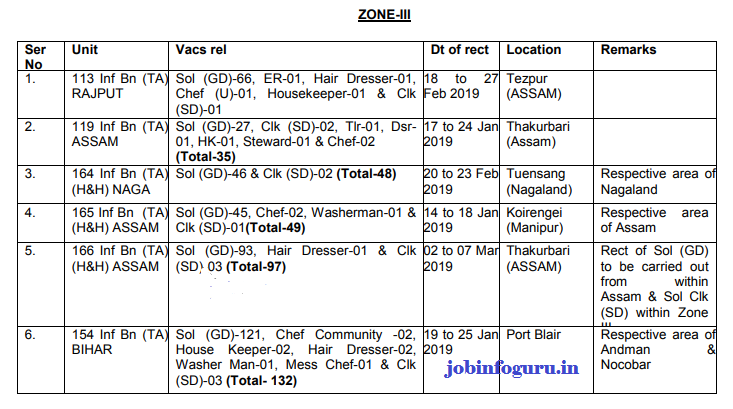 TA Recruitment Zone III: TA Army Bharti Program Assam, Meghalaya, Manipur, Tripura, Nagaland, Sikkim, West Bengal, Mizoram, Arunachal Pradesh and Andaman & Nicobar Island. TA Recruitment ZONE –IV: TA Bharti Program Andhra Pradesh, Gujarat, Kerala, Tamil Nadu, Maharashtra, Rajasthan, Karnataka, Telangana and the Union Territories of Dadar and Nagar Haveli, GOA, Daman & Diu, Lakshadweep and Pondicherry. Age Limit for TA : Age for all category for recruitment in TA is 18 year to 42 Years of age. (a) Height : 160 cm/1.60 Meter/5.33 Feet for all candidates. 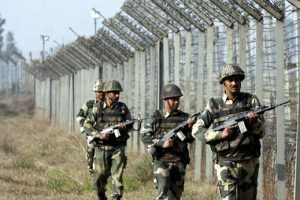 Soldier General Duty TA Bharti (Sol GD): 10th/High School/Matric pass with 45% in aggregate and 33% in each subjects Minimum education qualification for TA Bharti in Soldier GD category required. No percentage limit in case candidates have higher qualification as Intermediate/10+2/Higher Secondary . TA Soldier Clerk GD, SD, SKT: 10+ 2/Intermediate/Higher Secondary pass in any stream (Arts, Commerce Science) with 60% marks in aggregate and 50% in each subject. Should have studied and passed English and Maths/Accounts Book Keeping in Class X or Class XII with 50% marks in each subject Minimum education qualification for Soldier Clerk GD/SD/SKT for TA Bharti. 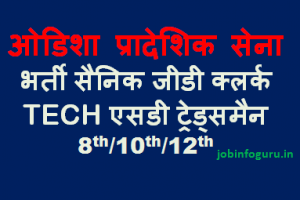 TA Soldier Tradesman/MTS: High School/10th Pass/Matric/ ITI minimum education qualification required for TA Bharti in Tdn Trades and for few Sol Tdn TA qualification required 8th pass only for recruitment in TA. Group I Race Marks: Candidates who clear 1600 meter race with in 5 minutes and 30 minutes will get full 60 marks in Group I. Group II Race Marks: Candidates who clear 1600 meter race with in 5 minutes and 45 minutes will get full 48 marks in Group II. 9 Feet Long Jump: Candidates have to clear 9 feet ditch jump for TA Bharti which is qualify in nature only. Zig Zag Balance: Candidates have qualify zig zag balance for TA Bharti which is very simple. Final Merit for TA Recruitment Rally Bharti: On the basis of physical fitness test, medical examination and interview final merit list will be prepared and candidates will be selection only on merit basis. TA Recruitment Notification and TA Bharti Result will be published by the TA Regiment conducting the recruitment rally. Command, Lucknow (UP) – 226002. Command, Fort William,Kolkata (WB) – 700021. 1. High School / SSC / 10th Class Certificate and Mark Sheet. 2. Intermediate / HSC / XII Class Certificate and Mark Sheet. 3. Graduation Degree Mark Sheet and certificate. 4. Residence Certificate with photograph issued by the authorised signatory of the State Government / Tehsildar / SDM. 5 (a) Religion Certificate: Religion certificate issued by Tehsildar/SDM (if Religion as “Hindu/Sikh/ Muslim/ Christian” is not mentioned in the case certificate). 6. Character Certificate from last education institute (Not more than six month old). 7. Character Certificate from Village Pradhan or Sarpanch or Administrative Officer(Not more than six month old). (a) Represented India at International level. (b) Represented State at National Level. (c) Represented District at National Level. (d) Represented University Team or Regional Team at District Level. 10. ITI Certificates for concern candidates. 11. Computer Certificate, Candidates having O+ Level Computer Certificate ‘Business Professional Programmer’ issued by the DOEACC Society for Soldier Clerk/SKT. 13. In case of Non Matric Candidates, Transfer Certificate signed by Headmaster/Principal of the school & countersigned by District Education Officer and Mark Sheet of last examination appeared, duly affixed with school seal and attested by Headmaster. 15. Sixteen latest coloured 34mm x 45mm passport size photographs not taken earlier than six months with Name and Date of Birth printed on bottom of photographs of the candidates. The photograph should be without facial hair (Beard) and preferably with light coloured background and plain/light coloured shirt. 16. Son of Servicemen/Son of Ex Servicemen/ Son of war widow and battle casualty (a) There is provision for instant enrolment for Son of Service person and Ex-servicemen. Sons of War Widows and Battle Casualties, Eligible candidates to contact concerned Army Recruiting Office. 17. In case of son of serving soldier of JCO/ OR or Officer/ son of Ex Servicemen, relationship certificate duly signed by Chief Record Officer/Senior Record Officer of respective Record Office with date of birth, Joint Photographs of the candidate with his father will be produced. 19. All candidates will bring an Affidavit duly signed by the candidate on Stamp paper and attested by a Notary (format attached). Format of affidavit is given below. 20. Candidates are advised to take care of their documents/belongings against theft during rally. 21. Attested photocopy / printout of education certificate obtained from the Internet duly attested by the school Principal will be accepted at the Rally site for candidates whose original certificates have not been received from the concerned education board after declaration of the result or for candidates who have deposited their certificates in some other institute where they might be undergoing some professional course. 22. Affidavit: Duly signed by candidate on Rs 10/- Non-Judicial Stamp Paper as per specimen duly attested by notary will be submitted by candidate. 23. Single Bank Account, PAN Card & Aadhar Card: Single Bank Account, PAN Card and Aadhar Card are mandatory documents for final enrollment for purpose of Pay & Allowances and other social benefits scheme. (c) I am married / Unmarried. 2. I give an undertaking that all documents submitted by me are correct. All docu issued by govt org / offices have been signed by authorized designated and govt officials. If any docu at any stage is found fake, I am aware that I will be dismissed from service and FIR will be lodged against me. Search Link: TA Bharti. All Zones TA Bharti. TA Bharti Zone 1, 2, 3, 4. TA Rally Bharti. TA Recruitment Rally. TA bharti rally notification. Indian Army TA Bharti. Territorial Army Recruitment Notification. TA Bharti Result. Result for TA Bharti. All Indian TA Bharti Rally program. TA Bharti Program. 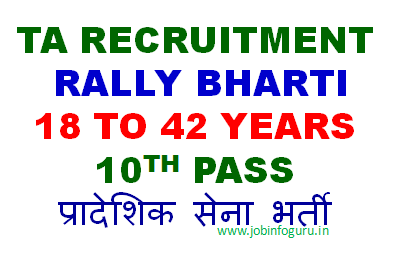 TA Bharti Rally Zone I, II, III, IV Notification. 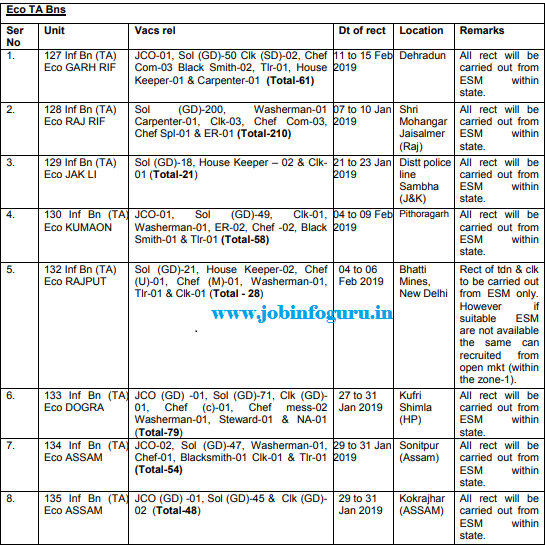 Indian Army TA Recruitment Rally Notification. TA Army Rally Bharti schedule 2019. Army Bharti TA 2019. 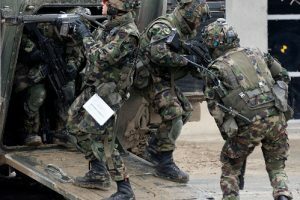 TA Army Bharti 2019. Hello Krutik, Offline rally bharti. Hello Khan, aap ko jo kuchh likhna ho comment box me clear likhen, Thank you. Hello Aamir, contact recruiting TA Inf Bn for more information. Hello Samba Siva, Thank you very much. Hello Md Riyaj, Wish you all the best, Join Indian Army. Hello Arun Kumar, apply for Army Bharti till 23 years of age, you may apply for Army, Navy, IAF for Non technical upto 21 years of age. Hello Tirath, please join as per program. 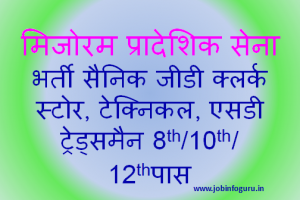 Hello Santosh, visit on “TA Bharti 2019-2020 jobinfoguru” for date and place of TA Bharti. Hello Rakesh Kumar, visit on “UP TA Bharti 2019 jobinfoguru” for complete information about ta bharti. Sir please help me out. Me bachpan se delhi me rehta hu rent pe but mere pass domicile certificate nahi hai to kya hoga sir please bata do sir. & kya kya documets leke jane hai waha rally me apne sath please help me sir. Hello Mohit, please read the complete instructions and take action as per reply given earlier. Sir mujhe TA ki open rally me jana h Delhi Cantt feb me but mere pass Domicile certificate nahi hai Delhi ka baki mene studies waghera sab kuch delhi se hi ki hai to sir kya hoga .please help me sir plz. or us din rally me kya kya docments leke jane hai sir. please help me out sir. Hello Mohit, Aap jis state ke rahane vali hain aur jahan se aap ko mool nivas praman patra bana hai aap vahan se TA join kar sakte hain. TA Officer post ke liye aap kahin se bhi apply kar sakte hain. wish you all the best Mr Dev. When will the open rally bharti at koreingei conduct?? Which have been postponed. Sir my sslc eng mrks in 30 I am eligible for rally…? Hello Talim, visit on “MP TA Bharti 2019-2020” for more information. Good evening sir, I am Jai kumar gowala permanent residence of west bengal attend 30 year. Am i able to join TA Bharti . Please update me. Hello Jai, visit on “WB TA Bharti” and report at place of recruitment. sir my hyderbad se hu moulali me rally hogay hai. kya my dusre state zone 4 me rally ke liye jasaktahu. sir main zone 4 hyderabad se hu , kya my dusre state zone 4 me jake rally me jasaktahu , aur dusre zone 1,2,3, me kuch chnaces hai kya jane ke liye. Hello Munna, please read the post complete all the info given. Hello RATTAN SINGH, which type of job required? Sir zone 4 kolhapur pur pn location kha he army bharti ka…. Hello Rahul, date of written exam will be given on the admit card for written exam. 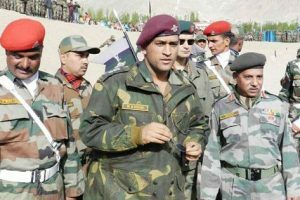 Sir my DOB is 11/12/1994 .Sir plz tell me about army rally .I want to go to indian army. Sir,My Name is- Kilung Nriame from Assam. I am Interesting Army TA .plz Inform us Reguirement. Cont,-600235235. Hello Kilung, visit on “TA Bharti 2019-2020 distric state wise” for more information. Hello Showkat, wish you all the best. Hello Swarn, TA me negative marking nahi hoti hai. T.A. me sikh married lagti hai ke nhi or kitne par marit list lagti hai. hello sir, Please sir tell me ki T.A. bharti me sikh married lagti hai.